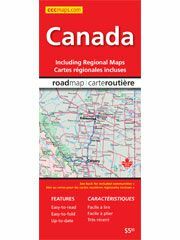 If you are looking for that perfect road map of Canada to keep in the glovebox of your car, this one is it! Produced by Mapart, a map publisher in Ontario, Canada, this map clearly labels the provinces and shows major roads and highways throughout the country. Canada is shown on one side while on the reverse are insets of Southern BC, the are around Winnipeg, the Atlantic Provinces and more. Also includes a distance chart.